The Belgians must be proud. The reinstated [and, looking at the new Bus Stop chicane, one might say reincarnated] Spa proved its worth on Sunday with an enthralling, magnificently dramatic race  certainly the best of the year so far. In a season where one team has dominated in almost yawn-inspiring fashion, it has been a race of severe upsets, of unlikely pole position and unlikely winner, of unlikely overtaking manoeuvres and unlikely tyres bursting. With gasping spectators pouring enough adrenaline out onto the track to cause constant redeployment of the safety car, which, in turn, provided us with undoubtedly the most seat-edging final three laps in recent Formula One history. Of course, it also provided us with the unlikeliest of second places. Irregularity ripped through the air as soon as the five red lights went out, the whole field seeming to push effortlessly past a seemingly stationary scarlet car in second place, Fernando Alonso and David Coulthard muscling through at the very first corner. Rubens Barrichello, the man who leads, in every possible sense of the phrase, a semi-charmed kind of life, was encountered by the careening front wing of Mark Webber's Jaguar, as the Australian hit the brakes disastrously late into the hairpin. These two, with a handful of other relatively speed-compromised yet drivable vehicles, made their way towards Eau Rouge, Formula One's most romantic corner. The lack of a front wing left Webber without any downforce, and the resulting fact that he playfully slapped Takuma Sato's BAR as he charged flat-out through the fierce corner was not a surprising one. The Japanese driver obstructed the field lethally, but was miraculously avoided by all incoming traffic: they smashed into each other instead. Zsolt Baumgartner ploughed right into the back of his safely braking teammate Bruni, and was joined in this Gianmaria-smashing effort by Giorgio Pantano's Jordan. Webber, Sato, Bruni and Pantano were out, and Juan Pablo Montoya took advantage of the chaos to inch a few positions ahead. With debris all over the field, the race looked certain to be red-flagged, an option that would seem rather circumspect given the back of Bruni's Minardi momentarily ablaze, and the fact that Ralf Schumacher's horrifying shunt at Indianapolis could have been frighteningly replayed at one of Formula One's faster circuits. Race director Charlie Whiting cryptically begged to differ, and, justifying his inane decision on the grounds that no driver was visibly injured at the time, decided to let the race go on. Four laps of circuit-scrubbing later, the race was back on, and the Finn took advantage of the World Champion's cold Bridgestones for fourth place. Two Renaults, followed by two McLarens, at the head of the field. Then came audacity at its most spectacularly brilliant. The Colombian, with a season where his feet occupied room beside his molars far more frequently than at the pedals of his BMW-powered car, decided the time had come to justify to the world why exactly he entered the sport with all that hype; why his soundbytes still make people sit up and listen [even if, as of this season, they invariably chuckle rudely afterwards]; and why people like Ron Dennis still decide to sign him on. He did this in undeniable style as he swept majestically past a cold-tyred Schumacher at the Bus Stop chicane, the German unable to respond in speed, and allowing him space. It was one of those supremely character-defining moments, almost salvaging Juan Pablo's racing reputation. Almost. Mario Puzo, in his brilliant novel Fools Die, elucidated in detail the need to walk away while leading, to quit while ahead. Which, he expostulated, was what we ought to do, but unfortunately, the greatest of us are the only ones who do not bow from this increased temptation. Which is why the house always wins. Juan Pablo Montoya, having pulled off an incredibly daring move on the world's greatest racecar driver, should have, rightfully and deservedly, basked in the glory of this success for quite some time. He has driven abysmally almost throughout the season, and this was wonderful, well-earned respite. Instead, he tried to top himself with a ridiculously positioned attempt at a replay. Jarno Trulli's unsuspecting Renault was the victim of this ludicrously optimistic move, and spun around. Meanwhile, Antonio Pizzonia sauntered around the corner and merrily leapfrogged them both. The Colombian swiftly restored himself to the status of a cockeyed Tabby cat, ineffectual but with a rather annoying meow, as his novice temporary teammate chugged happily into the distance. The mouse always wins. Jenson Button flew through into Les Coombes confidently, oblivious of the fact that he had a punctured right rear tyre. A flat, reacting at 205mph, is a nightmare by any standards, and his burst Michelin caused him to spear violently into the midriff of Zsolt Baumgartner's Minardi. Thankfully, there was no serious injury, while both cars were obviously instantly out of the race, leaving behind tons of debris for the race officials to remember them by. Tyres, a key factor in the race, now pose a crucial question  which is to be preferred: being crawlingly slow off the tracks, for the first few laps after every restart, to see your laptimes tumble miserably low? Or to be the alternative, a rather zippy starting French alternative, which had three massive, high-speed punctures  Button, Coulthard, Montoya  during the race? Hmmm. Yes, an insanely eventful race by any standards, but what of victory? As fan-jaws dropped all the way to Lap 31, we were treated to the glorious sight of Michael Schumacher right on the heels of Kimi Raikonnen, both crawling impatiently, stiffly up the back of the safety car. Kimi slowed down almost completely, built up time with the rest of the field caught in a treacle huddle behind him, and masterfully roared off into the distance. Michael Schumacher, with frustratingly cold tyres, needed a few laps to respond, and this he did. Closing at the rate of over half a second a lap with an adequate number to go, David hit Klein, their wings in an unholy embrace calculated to bring the safety car out again. There is a tremendous amount of history curtained precariously behind the word 'IF'. What if the Safety Car hadn't come out and left Michael only three laps? What if the Champion's tyres weren't so obviously disadvantaged at every restart, in a race with frustratingly too many? What if Michael had caught up, as he was wont to, with the Finn, with six laps to spare? What IF? 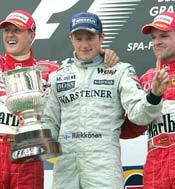 Michael Schumacher, make no mistake, lost the Belgian Grand Prix. There are several reasonable points of view to be offered to contradict the fact, reflecting more on accursed fate than on the German's indubitable racing merits, but this was not he at his best. He was overtaken more often than he is used to; he was manhandled at the start; and sizzled the timesheets, but not as often as he was required to. By his godlike standards, this was an inadequate performance. Whenever on the threshold of tremendous history, we have seen the Master's hands quiver, be it at the verge of maximum race victories, or as he took Title Six. Seven, the most dominant world championship in history, did not come with a win. Second place will rankle, for this is not a man used to being beaten. Kimi Raikkonen has paid Schumacher the ultimate tribute  by driving, and winning, a race like only he would. The incandescent, contemptuous overtake of the teammate flat-out at Eau Rouge; the consistent times even with handling trouble and a shaky floor; the persistent magnificence shown at every single restart; and the breathtaking demonstration of stunning pace over the last three laps  setting the fastest lap of the race on the restart lap itself, and ensuring the top step of the podium in unparalleled style. He has had a dismal season, but has redeemed it with an awe-inspiring victory. The Finn is back. He has done Spa a la Michél. And it's only his second win.